At 2-0 down going into the 89th minute it would be fair to say things didn’t look too bright for Coleraine on Saturday. But cometh the hour cometh the man, and for the second week in a row Jordan Allan came off the bench to salvage an unlikely draw for the Bannsiders. The on-loan striker hit two quick fire goals to stun Ballymena United, who looked certain to grab their first win over Coleraine since 2014. But they failed to account for the heart shown by Oran Kearney’s side. Seven days earlier they produced a similar escape act against Glenavon when Allan and Jamie McGonigle combined to seal a 2-2 draw. Kearney though admitted afterwards that his side needs to start games better. “We should be getting out of the blocks better,” he said. “We must focus on scoring earlier in games and taking a bit of pressure off ourselves. 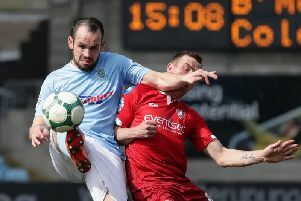 It may have been hard for the Sky Blues to take but Kearney made no apologies for scoring late on. “It’s a 90 minute game and you can score goals at any stage of the game. I have no remorse about scoring early or late goals. “There is never a bad time to score a goal, we are entitled to do that. “We have conceded late goals and I know how that feels and I am pleased that we fought until the end of the game,” said Kearney. The Bannsiders boss also praised two-goal hero Allan for his match saving contribution. “We brought Jordan here because this is exactly what we knew he was capable of producing,” he said.